This momentous book argues that the four Gospels are closely based on the eyewitness testimony of those who personally knew Jesus. Noted New Testament scholar Richard Bauckham challenges the prevailing assumption that the accounts of Jesus circulated as "anonymous community traditions," asserting instead that they were transmitted in the names of the original eyewitnesses. To drive home this controversial point, Bauckham draws on internal literary evidence, the use of personal names in first-century Jewish Palestine, and recent developments in the understanding of oral tradition. Jesus and the Eyewitnesses also taps into the rich resources of modern study of memory, especially in cognitive psychology, refuting the conclusions of the form critics and calling New Testament scholarship to make a clean break with this long-dominant tradition. Finally, Bauckham challenges readers to end the classic division between the “historical Jesus” and the “Christ of faith,” proposing instead the “Jesus of testimony” as presented by the Gospels. 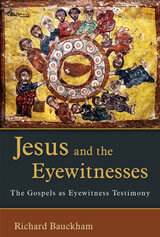 Sure to ignite heated debate on the precise character of the testimony about Jesus, Jesus and the Eyewitnesses is a groundbreaking work that will be valued by scholars, students, and all who seek to understand the origins of the Gospels. Richard Bauckham is professor of New Testament studies and Bishop Wardlaw Professor at the University of St Andrews, Scotland. A fellow of both the British Academy and the Royal Society of Edinburgh, he has also written Bible and Mission: Christian Witness in a Postmodern World. Abstract: This book explores the ways in which the symbolic associations of the body and what we do with it have helped shape religious experience and continue to do so. A Church narrowly focused on Christ's body wracked in pain needs to be reminded that the body, as beautiful and sexual, has also played a crucial role not only in other religions but also in the history of Christianity itself. Dance was one way in which the connection was expressed. The irony is not that such a connection has gone, but that it now exists almost wholly outside the Church. Much the same could be said about music more generally, and this book talks about the spiritual potential of not just classical music but also pop, jazz, musicals, and opera. David Brown is Professor of Theology, Aesthetics and Culture and Wardlaw Professor at the University of St Andrews. While Professor Brown’s earlier career focused on the relations between theology and philosophy, in more recent years his interest has broadened to theology and culture more generally. 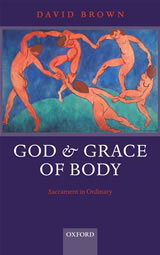 Recent publications include God and Grace of Body: Sacrament in Ordinary (2007); and God and Mystery in Words: Experience through Metaphor and Drama (2008). In contrast to many studies of New Testament ethics, which treat the New Testament in general and Paul in particular, this book focuses on the person of Jesus himself. Richard Burridge maintains that imitating Jesus means following both his words - which are very demanding ethical teachings - and his deeds and example of being inclusive and accepting of everyone. The Revd. 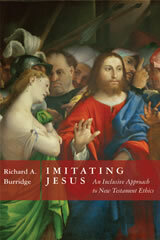 Prof. Richard Burridge is Dean of King's College London, where he is also Professor of Biblical Interpretation. His other books include What are the Gospels?, Four Gospels, One Jesus?, and Jesus Now and Then. A cri de coeur to the teaching church to ‘think again’ from one of the most innovative and influential theologians of the twentieth century. 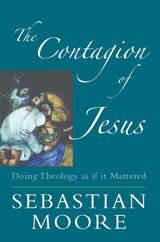 Sebastian Moore describes The Contagion of Jesus as ‘passionate rather than rigorous theology’, based on a loving God, a saving Christ, and a church of friendship and discipleship. Published to coincide with the author’s 90th birthday, it will introduce a new generation to the work of a spiritual master. Sebastian Moore OSB is a monk of Downside Abbey and the author of several celebrated books including The Crucified Jesus Is No Stranger and The Fire and the Rose Are One. 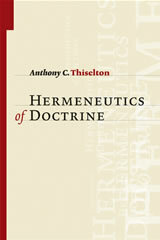 Drawing on the resources of contemporary hermeneutical theory, Anthony Thiselton in this volume masterfully recovers the formative and transformative power of Christian doctrine. The past thirty-five years have witnessed major steps forward in the use of hermeneutics in biblical studies, but never before has hermeneutics made a comparable impact on the formulation of doctrine and our engagement with it. Indeed, no other book explores the interface between hermeneutics and Christian doctrine in the same in-depth way that this one does. Throughout the book Thiselton shows how perspectives that arise from hermeneutics shed fresh light on theological method, reshape horizons of understanding, and reveal the relevance of doctrine for formation and for life. Arguably the leading authority worldwide on biblical and philosophical hermeneutics, Thiselton has written widely acclaimed works in the areas of biblical studies and philosophical theology. His probing interaction in The Hermeneutics of Doctrine with numerous other great thinkers — Gadamer, Ricoeur, Lindbeck, Balthasar, Vanhoozer, Pannenberg, etc. — and his original perspectives will make this volume a valuable resource for scholars and advanced students. Anthony Thiselton is professor of Christian theology at the University of Nottingham. Among his many other books are The Two Horizons: New Testament Hermeneutics and Philosophical Description, the NIGTC volume on 1 Corinthians, and 1 Corinthians: A Shorter Exegetical and Pastoral Commentary (all Eerdmans).